I enjoy every second of my twelve-minute lie in and then dash downstairs at 6:12 a.m. – chaos. Start calculations – need to arrive at 11 and it’s a 38-minute drive – allow an hour in case of stops, emergencies, getting lost time and Saturday traffic. 5 to 60 minutes for breakfast and clear up. 30 to 90 minutes for dressing to include, socks, shoes and teeth cleaning. 10 to 25 minutes toileting, jackets and entering car with seat belts buckled. Equals 3 hours and 55 minutes – loads of time and time to spare. Both the boys have left their warm jackets at school for the weekend – normally this wouldn’t be a problem, seeing as how we rarely venture far from home, and when we do, it’s more likely to be around mid-day when the chill has burned off – today we head out to the wilds of Monterey where they have weather and mud. Dig out second, old pair of shoes for them both, select favorite snacks as bribes, drinks, check first aid kit, and pack all possibly emergency supplies in the hope of successfully surviving as solo parent during an hour’s drive. Grab camera at the last minute – if there is one single moment of joy I shall capture it for the record. Watch a woman outside on the road running for her life, otherwise known as jogging – if I could get someone to watch the children, I would do likewise. 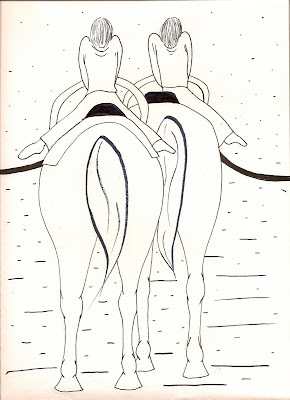 We were offered two places at the therapeutic riding center a couple of years ago – the boys weren’t ready. We were offered places again last year – just before the budget cuts. So here we are, third time lucky, possibly. In the car we try to listen to a CD of Horrid Henry – ‘The Hike’ – written by Francesca Simon and read by Miranda Richardson,* over the din of the boys who scream in the back. I allow my daughter a reprieve, up in the front passenger seat now that she’s only an inch shorter than me. I keep an eye on her – self wrapped, clamped tight and hunched, as she turns her face towards me, “Horrid Henry wouldn’t last five seconds in our household!” Although the boys give every impression of oblivion, they both manage to chime in perfectly, every time the story reader says ‘Stop it Henry! Don’t be horrid!’ My daughter rolls her eyes with exasperation. She pushes herself back into the headrest and shuts her eyes. “If they can’t make a spectacle of themselves at therapeutic riding stables for differently abled children, where can they?” I beam. She giggles and flutters her eye-lids – wicked. Arrive at the stables, late, with two screaming children – doesn’t give the best impression of our family. Vomit noises emanate from my youngest – farm fresh air doesn’t suit everyone, “dat is a worserer smell dan my bruvver!” He falls out of the car, wraps his arms around his skinny rib cage, and tippy toes off like a top, in the general direction of the office. His older brother staggers in the same direction, hunched like an ancient, as if every limb drags half a hundred-weight of potatoes. The pre-teen looks on, aghast, but is quickly distracted by more interesting eye candy – horses. One whole hour of introductory, orientation. We drive back home – the boys are out cold in the back, mentally, emotionally and physically exhausted. “That was funny,” she giggles. I think of the many, many hours my daughter has endured in waiting rooms as her brothers were tortured by every conceivable variety of therapy known to mankind, while she would salivate at the window, hoping for the chance to share a few moments occupied with similar activities. She’s been short changed for far too long, just like all the other children in the Siblings book I read last week. I drive a few more miles in silence as I watch her brain whir, from the corner of my eye. I try to think what I did, more than a decade ago? I have no recall whatsoever. Whatever it was, it’s clearly unremarkable. It strikes me that if I sit down, static, I’m highly likely to pass out – I could win an award for sleeping if I ever had the opportunity. “Spose…..I’ll take an alarm if you like?” she offers. p.s. I do not endorse this as being either beneficial or curative, be that cat, dog, tortoise, horse, fish or dolphin therapy, although this does appear to be an exceptionally progressive program. ‘Beneficial,’ is more than enough. Anything else is a bonus. There is the remote possibility of a little enjoyment if we’re lucky. Failing that, in any event, at the very least we shall have spent a quantity of time outside the house, otherwise referred to as the ‘cell,’ and expanded our horizons by an inch or centimetre. * Highly recommended to improve aural processing, [and fun] but don’t blame me if your children acquire an English accent. A bonus for the digital and tactile challenged person. Never look a gift horse in the mouth! Posted on March 21st, 2010.